In this article, we’ll take a look at the new Google versus the old Google and ask the question: Has Google lost their way or found it? This past Friday night I was dining with a friend who works in real-estate but stays somewhat abreast of Internet technology. He noticed that I had created and updated my Google Plus profile recently and asked me why I had started using Google Plus with more frequency. I responded that Google has just instituted Google’s Search Plus Your World which favors many Google properties, like Google Plus, in the search results. Do you remember the ads that you saw on TV that first prompted you to use Google for all of your web searches? When you become a verb, you have won. But once you have won, how do you stay on top? The new Google Now clearly intends to thrive with a completely different model, providing subjective results and getting the word out through the more formal vehicle of advertising. The simple question my friend asked “…I thought Google succeeded because they provide objective results?” signals the biggest change in Google to date. With this new Google Plus Search Your World feature, Google is clearly manipulating search results to favor Google properties. Not only do we see Google Plus searches being favored, all Google properties are favored. For certain topics, YouTube simply dominates the results. And, frankly, on most occasions I do not favor a video over text. (3) I type “cooking” into Google and the whole right side of the screen features Google results as you see in the photo below. 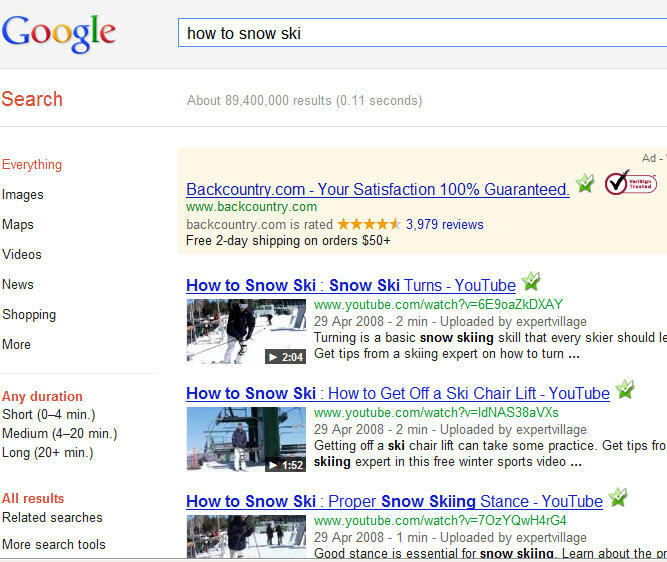 While Google Then succeeded virally, Google Now uses a different model: Advertising! We already know Google Then succeeded beyond anybody’s wildest dreams using a simple model of great objective search results that created a viral, word-of-mouth success. Google built it and, without any advertising, people came. Can Google Google Now, with their new model of more subjective results and increased advertising, continue the success of Google Then? This is the billion, or possibly trillion, dollar question! We know one thing: businesses, especially Internet businesses, have to adapt to survive. Nobody can begrudge Google for doing what they think is best for their company. Business adaption is often precipitated through heightened competition. And, in this case, the competition is Facebook. As we see in the photo below, Google and Facebook are now the #1 and #2 most visited websites on the web according to Alexa. However, if you break down the different Google properties, you find many that say Facebook is the Most Searched and Visited Website of 2011. In the heat of this competition, Google is adapting. They have fully launched their social media strategy with Google Plus, which seems to be growing at a rate unknown even to Facebook. This would indicate that they are heading in the right direction. But, they are also changing their money maker–Google search. Estimates vary and Google remains tight-lipped about their revenue breakdown but it’s no secret that the bulk of Google’s revenue still comes from the Google search results. By providing subjective search results, Google Now is threatening the core revenue producer. Will Google Now be the “New Coke” that failed miserably? The answer to this is unknown. But we do know that many people are now dissatisfied with the New Google results and speaking about it. Many have complained that the new Google search returns Google Profiles of people who are not even active on Google Plus. A much better result would be the Facebook page of that individual or business, which Google is often not showing. In one recent outcry, prominent site LifeHacker wrote an article entitled How to Turn Off Google’s Annoying New Personal Search Results. Most people (as yet) don’t seem to like the new subjective results and, frankly, most people probably won’t want to actively turn it off. They may instead just look for a new search engine. We know that New Google hires some of the brightest people in the world to house in their Googleplex. They obviously know that they are taking a large risk, but feel that it is a risk worth taking. But we cannot overlook the point…if people leave Google search, the empire crumbles. I began this story with an anecdote and I shall so conclude. I like to travel and, when I don’t have my laptop, I pop into Internet cafes. Recently, in a full Internet cafe in Argentina, I looked at the screens of the 20 computers in use: All 20 people in the cafe were on Facebook. I watched their movements. The only time that they exited Facebook was to search for something on Google. After a quick search, they exited Google and went to the page that they were searching for and then quickly back to Facebook. What if Facebook implemented its own search feature? Google Cache: An Emergency Web Backup? Richard CummingsGoogle Then and Now: Has Google Lost Their Way…or Found It?